GULABI GANG has won the top prize at the Norwegian Short Film Festival in Grimstad, where it was screened publicly for the very first time. 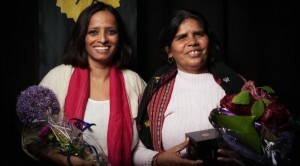 Director Nishtha Jain and Gulabi Gang leader Sampat Pal were in Norway for the Premiere of GULABI GANG, and accepted the Golden Chair award for Best Norwegian Documentary on Saturday. “Violence against women is violence against the entire society. When authorities are indifferent hope is placed in the hands of brave individuals, in this case; the director and her main character. Armed with words, the fearless protagonist finds herself face to face with unendurable situations in her struggle against oppression of women. Rather than witnessing the struggle from the outside, the film pulls us into the blazing conflicts and gets our hearts pumping. “ The jury said in a statement. A second Piraya Film production distributed by Kudos Family competing for the Golden Chair, BACK TO THE SQUARE, received honorable mention at Saturday’s awards ceremony. In 2010, RUSSIAN LESSONS, directed by Olga Konskaya and Andrei Nekrasov took home Kudos Family’s first ever Golden Chair award.